We got the expected breakout to the upside in most markets. With another week of lunar Green Period to go, it is quite likely that some medium term top is going to be made within the next 10 days. Our target of 1450 is now within easy reach. The question is whether we will get above it. Profit taking is likely to appear near 1450, so if the market stagnates near that level, then I would expect a correction to start, with the S&P dropping back below 1400 in October. Be ready for a top. This is a long term weekly chart. We see this market going up and down in a very large triangle pattern since 2007. The DAX is now closing in on the upper boundary of the triangle near 7400, so that is becoming an important resistance level to watch. My Earl indicator seems to be topping out already, and is showing a bearish divergence with prices. 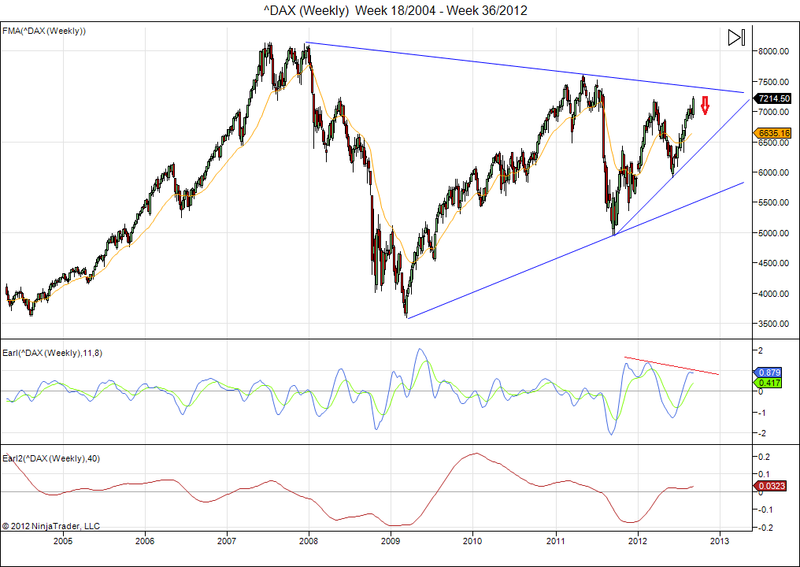 This suggests that the DAX is also close to forming a medium term top, just like the S&P 500 index. This entry was posted on September 10, 2012 at 6:52 am	and is filed under Market Commentary. You can follow any responses to this entry through the RSS 2.0 feed. You can leave a response, or trackback from your own site.